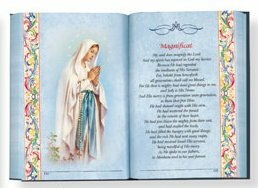 CATHOLIC GIFT SHOP LTD - Beautifully Coloured - Illustrated Book of Mary. Beautifully Coloured - Illustrated Book of Mary. Illustrated book of Mary with deluxe cover with gold foil stamping and embossing 244 pages beautifully colored.